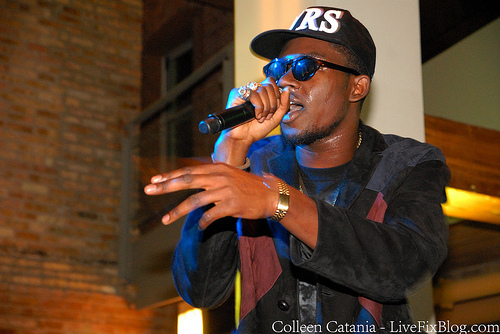 Concert Review: Is Touring Fatigue Getting To Theophilus London? A good time was had by all during the RE:MIX LAB as Theophilus London and Hollywood Holt laid down some righteous beats and fresh rhymes at the River Arts Center. Without a doubt, the glory of the groove flowed through the venue as fans danced and rocked oblivion to London’s new songs — an intoxicating mix of soul, post-punk, funk and hip hop — and Holt’s rockin’ blend of classic house and rap tracks. But there was something that London kept saying that made me think about the connection between live performance, fatigue and artistic creativity. At several points during the show, London kept saying that he was tired because he had been on tour for 38 straight weeks. Since this was the first time that I had seen London live, because we didn’t get to catch his set during SXSW 2011, I don’t have anything to compare this show with. Nonetheless, I still wondered how his fatigue was impacting the show. Did it make the show better or worse? During the show I thought back to my college baseball playing days and I remember a chat I had made with a fellow teammate who firmly believed that he played better on less sleep because it allowed him to be relaxed and play more naturally and fluidly. But Can The Same Be True For Live Performance? Can lack of sleep and physical and mental fatigue be an asset to an artist who struggles with stage anxiety? Possibly. What I do know is that London’s expressed fatigue didn’t take away from this show at all. And when he mentioned it I felt more emotionally connected to his performance and actually empathized with him. And judging by the reaction to the fans in the front row, I imagine they would say the same too. Of course, London isn’t the only, or the first artist, to struggle with tour fatigue, or express it on stage during the show. Lady Gaga, Adele, Kings of Leon, and many other artists have cancelled shows and entire tours because of the exhaustig demands of being on the road. So does constant touring have a negative impact on an artists creativity? And does that physical and mental fallout pave the path for a lackluster show and creative burnout? There’s no point in saying, ‘I don’t have an idea today, so I’ll just smoke some drugs.’ You should stay alert for the moment when a number of things are just ready to collide with one another… The reason to keep working is almost to build a certain mental tone, like people talk about body tone. You have to move quickly when the time comes, and the time might come very infrequently – once or twice a year, or even less. Clearly both of these thoughts and many other great insights in the article are completely at odds with the grinding schedule of touring and the rock star lifestyle. What’s An Artist Like London to Do? Are young artists like him who are building up their touring muscles more likely to be victims of touring fatigue than older artists? Does the extreme emotional outpouring and demands from fans at shows somehow contribute to artist fatigue? We’re going to continue this exploration on a future episode of Live Fix Radio and in the meantime here’s a video from the London show and a bunch of links I found that can help educate us on things like Chronic Fatigue Syndrome (CFS), sleep and creativity and other artist who’ve struggled with or overcome touring fatigue. Let us know what you think in the comments below. Check out more of Colleen’s photos here.